The Internet of Things (IoT) is at the heart of a powerful technology revolution. The act of connecting devices and systems to each other so that they can share data is the seed of new products, services, and experiences. Shared data will transform industries from healthcare to retail, accelerate scientific research, and change the way we live. Today, there are many IoT solutions based on Intel® ...technology in operation worldwide and the impact has been significant for businesses and consumers. But there are challenges to effectively deploying and scaling IoT. Currently, 85% of devices are not designed to connect to the Internet and cannot share data with the cloud. Securing the billions of things and devices already connected—and the massive amounts of data they generate—is a top-of-mind barrier to adoption for many industries and organizations. Interoperability is challenging in an ecosystem with hundreds of often incompatible products and complex multiproduct solutions. And, custom IoT solutions may fit a particular need very well—but be impossible to cost-effectively scale. 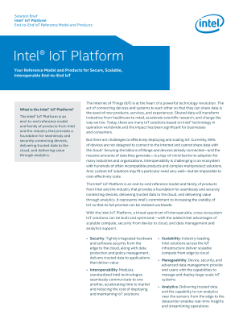 The Intel® IoT Platform is an end-to-end reference model and family of products from Intel and the industry that provides a foundation for seamlessly and securely connecting devices, delivering trusted data to the cloud, and delivering value through analytics. It represents Intel's commitment to increasing the viability of IoT so that its full promise can be realized worldwide. With the Intel IoT Platform, a broad spectrum of interoperable, cross-ecosystem IoT solutions can be built and optimized—with the added Intel advantages of scalable compute, security from device to cloud, and data management and analytics support.